US military veteran and congresswomen for Hawaii, Tulsi Gabbard, has slammed US foreign policy in Syria. “Since 2011 both overtly and covertly, the United States has been providing arms, intelligence, and equipment to fighters who are allied with, fighting along side, working with, al Qaeda in this regime change war. These statements are strikingly up front, given the fact that these policies began under Democratic Party President Barack Obama. It would be simplistic to see every anti-government rebel group in Syria as being ideologically identical. But the earliest evidence, including from western establishment sources that support intervention in Syria, is that the dominant ideology among the majority of the armed opposition groups has long been fairly reactionary. B. The Salafist (sic), the Muslim Brotherhood, and [Al Qaeda in Iraq] are the major forces driving the insurgency in Syria. The New York Times (NYT) reported, five years into the war, that the US had been arming and training Syrian rebels, in alliance with Gulf states like Saudi Arabia. Establishment economist and former member of the ‘Chicago Boys’ Jeffrey Sachs also noted this policy in an unusually candid discussion on MSNBC. Although the ‘paper of record’ implies that the US only started funneling weapons to rebels in 2013 (under a programme code-named Timber Sycamore) the evidence suggests otherwise. Investigative journalist Gareth Porter revealed last year how the same 2012 DIA report shows that the US funneled large amounts of weapons, with incredibly destructive potential, into Syria via Libya as early as October 2011. Alexander Decina also penned a very informative article on this subject in 2017. Decina, who is a Research Associate with The Council on Foreign Relations (CFR) argued that policymakers should stop searching for so called ‘moderate rebels’. The role of the CFR in shaping US policy is difficult to overstate. “[I]t’s good to have an outpost of the Council right here down the street from the State Department. “U.S.-backed and ostensibly moderate groups have even turned their fire on U.S. personnel. In late August, weeks after Free Syrian Army units first fired on U.S. patrols north of Manbij, U.S. troops finally fired back. One of the groups allegedly involved in the latest incident, the Sultan Murad Division, had received U.S. TOW missiles as late as February 2016. Decina’s recommendations could well have been the outlook of policy makers since the very beginning of the conflict. In 2015 US special forces (SF) veteran – turned journalist- Jack Murphy exposed dissension among the ranks of US troops engaged in covert (and illegal) military operations inside Syria. “The Syria covert action program is [CIA Director John] Brennan’s baby,” a former CIA officer told SOFREP. Weapons were provided to the FSA by the CIA … after receiving permission from the White House via a presidential finding. The FSA made for a viable partner force for the CIA on the surface, as they were anti-regime, ostensibly having the same goal as the seventh floor at Langley. 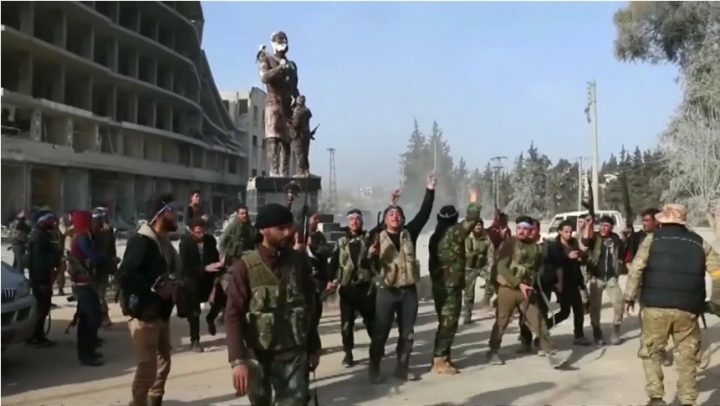 … As early as 2013, FSA commanders were defecting with their entire units to join al-Nusra. There, they still retain the FSA monicker, but it is merely for show, to give the appearance of secularism so they can maintain access to weaponry provided by the CIA and Saudi intelligence services. The reality is that the FSA is little more than a cover for the al-Qaeda-affiliated al-Nusra. In January this year, FSA rebels allied with the invading Turkish army to ethnically cleanse Afrin of its Syrian Kurdish population, and remove the Kurdish-led democratic government established there. And today Idlib is dominated by an amalgamation of right-wing reactionary groups. It is also worth noting that as early as January 2012 It was reported that British special forces and spies were working with FSA rebels in Libya, Turkey, Lebanon and Jordan. The point is that Tulsi Gabbard’s critique of US foreign policy in Syria is not based on rumor or speculation but rather well-documented facts. Whatever the crimes of the Syrian state, the British and American governments are not honest actors. Their actions in Syria have not only fueled the devastation in the country but completely violate international law. All this needs to be remembered as voices from the US and UK continue to threatened further military involvement in the country and as Turkey steps up its military presence in defence of the rebels in Idlib province. Mohamed Elmaazi obtained his LLB from SOAS and Masters in International and Comparative law from the American University in Cairo. He worked in human rights law for a number of years before shifting to journalism. He occasionally reports for The Real News Network and currently writes for Open Democracy and The Canary. He is a frequent contributor to Global Research.